The project is free software and licensed under the GNU GPL v3, with the source hosted at SourceForge.net. See there for more information, but you can also directly download the latest source-code release (which should compile on any common platform but depends on GTK+ 2) Island Mandel 0.20 (signature) from here if you prefer. For detailed instructions, see the README file in the source package. Here's just a quick guide. 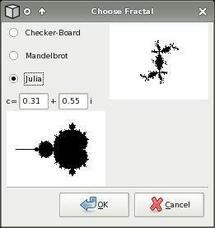 At the start-up, choose a fractal (or checker-board) to play on. Then for each round, a random pattern consisting of black and white dots will be created for you. The number of dots increases over time. 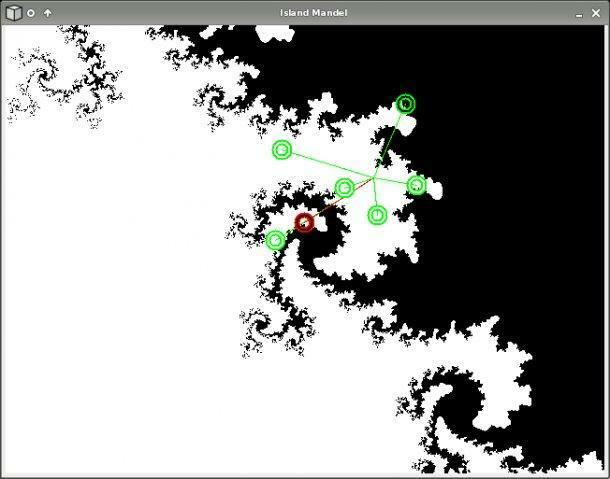 Your goal is to place the figure by moving, scaling and rotating it onto a fitting position in the fractal, namely such that each black dot is placed on the fractal and each white dot outside of it. When this is done (all dots are marked in green), press enter to confirm your placement. To achieve this, left clicks or dragging with the left mouse button move the pattern, right clicks (or dragging) scale and rotate. Clicks with Ctrl down move the fractal background instead (center it onto the clicked position), while Shift-Ctrl-clicks zoom in (left mouse button) and out (right button). Finally there are also keyboard commands available, but if you're interested, look them up in the README.